பணியிட எண்ணிக்கை :1பணியிட விவரம் :Project Associate - 01 postகல்வித் தகுதி :BE in Electronics/communication/ Computer science Engg. or equivalent, MTech/ MS(research) with a knowledge in signal/ image processing is preferred. 70% marks or 7.5 CGPA and above at UG level is a must. 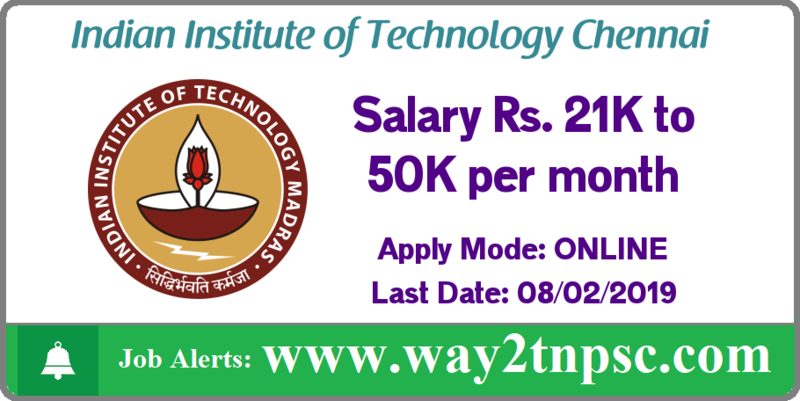 Indian Institute of Technology Chennai Recruitment 2019 has been announced for the below vacancies. Read the following Job Notification details to get a clear idea about Registration process, Eligibility, Qualification, How to apply, No of Vacancies, Salary, Job Location, Links to apply, Selection procedure, age limit and all the instructions before applying for this job. Click the FACEBOOK ICON below To get Alerts of All Job Notifications from WAY2TNPSC Interested and Eligible Candidates can apply before 08-Feb-19. Keep on reading this page to know all the above details. So, it will be helpful to know the procedure and details for the candidates who wish to apply for this particular vacancies. Indian Institute of Technology Madras is a public engineering institute located in Chennai, Tamil Nadu. As one of the Indian Institutes of Technology, it is recognised as an Institute of National Importance. Founded in 1959 with technical and financial assistance from the former government of West Germany, it was the third IIT that was established by the Government of India. Salary :Rs. 21,500/- p.m to 50,000/- pmEducation Qualification :BE in Electronics/communication/ Computer science Engg. or equivalent, MTech/ MS(research) with a knowledge in signal/ image processing is preferred. 70% marks or 7.5 CGPA and above at UG level is a must. The above Notification ( IIT Madras Recruitment 2019 for Project Associate Posts | Apply online ) briefly describes about the details of latest announcement or notification includes important dates like release date , last date of application submission, details regarding fees, exam timings. Candidates, check all the needs and apply accordingly.